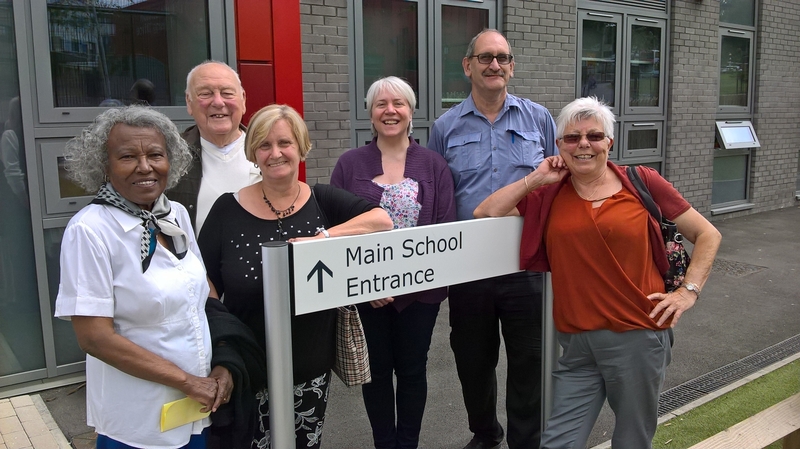 Little London Community Primary School have extended a hand to Caring Together staff and members and invited us to participate in their school lunches. This will take place on a monthly basis and a roast lunch with vegetarian option will be available. Six people from Caring Together attended the first meal yesterday with each of them sitting at a different table with the children. This is a great initiative and can only be positive for building more solid links within Little London and across the generations. 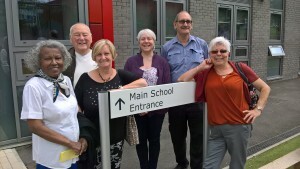 A big thank you to the staff at the school who facilitated this and to the children who made us so welcome. The is the second time that Little London Community Primary School and Caring Together have cooperated together on a project over the past 2 weeks. More of this we say. There’s lots happening in our city this weekend. 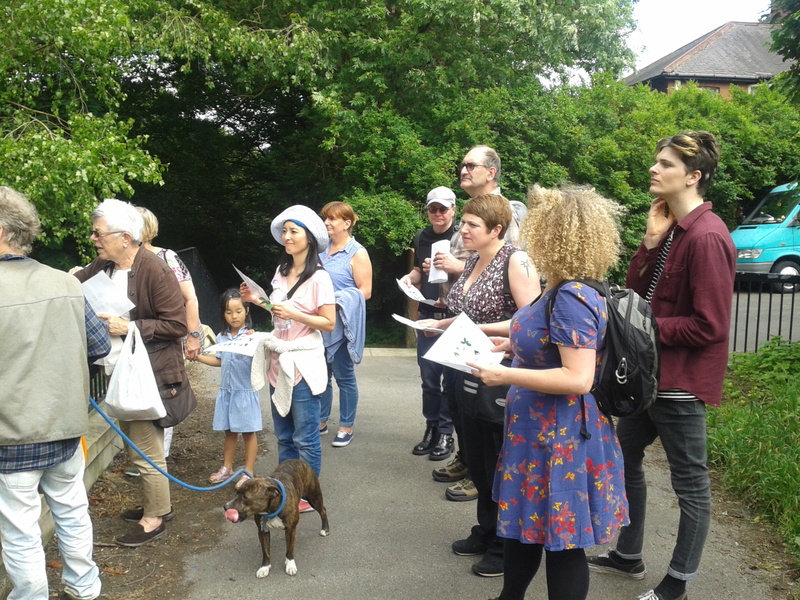 Leeds First Bird Fair – Rodley Nature Reserve 9.30am – 4pm: Celebrate the wildlife and green spaces of Leeds and beyond, bird races, walks, activities, photography, things to buy, food. There’s something for all wildlife lovers. Leeds Waterfront Festival – 25 & 26th June The 2 day festival brings the city’s waterways alive each year by hosting a fantastic eclectic mix of music, performance, arts and fun for all the family. The festival will be jam-packed with activities and creativity on the water, boats and on dry land, stretching across 4 miles of Leeds waterfront. 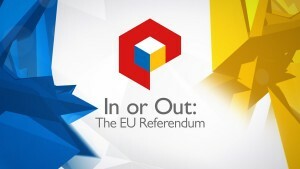 Held at Granary Wharf, Brewery Wharf, Leeds Dock, The Tetley, Armley Mills, Thwaites Mills and other locations. History Walk at Middleton Railway Sunday 26th June – Catch the 11am, 1pm or 2.40pm trains or meet the walk 10 mins later at Park Halt. And too many other things to mention! Here’s hoping we get some decent weather! 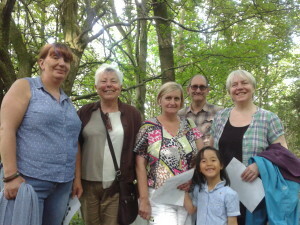 Lisa, Valerie and some of Caring Together’s members went on a Tree ID walk this week organised by Oblong and Leeds Coppice Workers. It was a really enjoyable end to the afternoon to stroll in the sunshine and to actually take a look at the trees and nature that are on our doorstep and that we often just don’t notice. 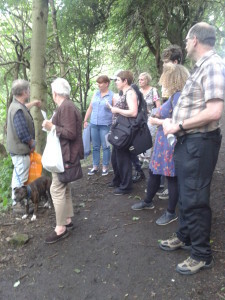 Many thanks to Dave from Leeds Coppice Workers for an interesting an informative walk. The next plan is to maybe have a similar walk looking at edible plants. Caring Together’s Midweekers Group held its first session at Little London Community Centre yesterday. 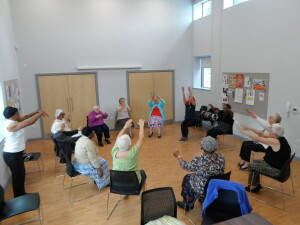 All present felt that it was a good venue for social groups with enough space to also hold exercise classes. The move to the new venue was part of Caring Together’s focus on achieving more of an even balance between the activities and services that we provide within Woodhouse and Little London. After all the weeks of discussion and argument the referendum day is finally here. This is an enormously important day when we get to decide the UK’s future, not just who governs for the next 4 years, but our future for generations to come. 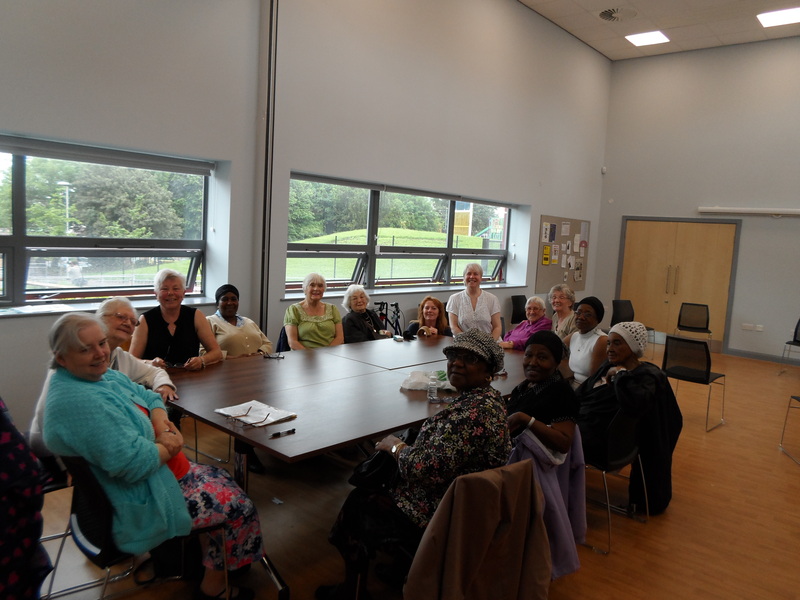 It looks like the sun is going to shine on our walking group again today as they take a stroll along the waterfront to Leeds Minster. 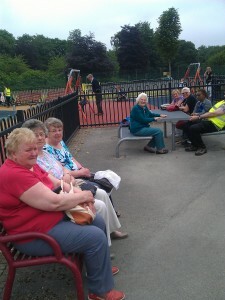 They are pictured taking a break during the last walk (a fortnight ago) from West Park to Headingley via Becketts Park. Join Oblong and Leeds Coppice Workers for an informal tree id walk on Woodhouse Ridge today. Meet at Woodhouse Community Centre at 4pm. This follows on from the very enjoyable Early morning bird chorus walk last month, but you don’t have to get up quite so early! First bus services in Leeds are affected by a further day of industrial action on Monday 20th June. Up to 3/4 of bus services in Leeds could be affected by the strike. Bus routes operated by other companies will not be affected and trains will also be running as normal. If you need to travel today, check before you set off. Up to date information can be found on the West Yorkshire Metro website. 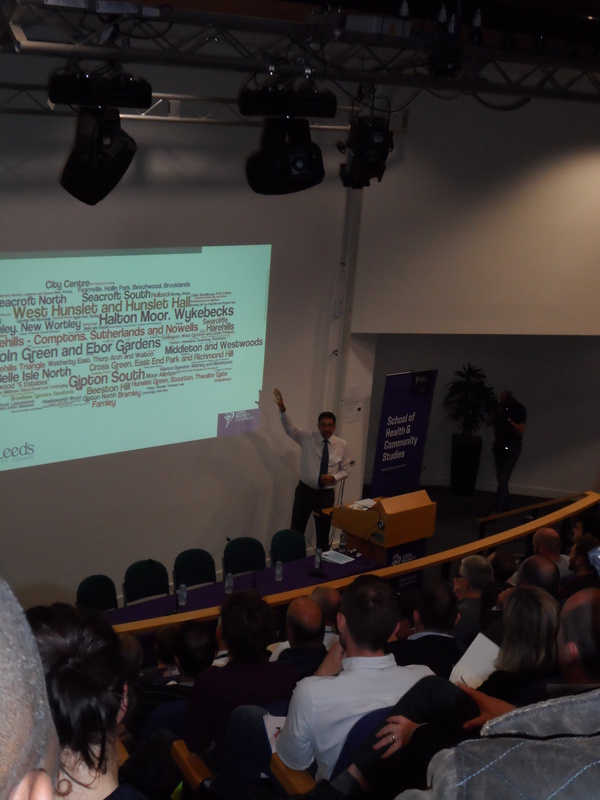 Caring Together were present at the launch of the report: The State of Men’s Health in Leeds yesterday. A very good attendance heard various speakers discuss the reports findings followed by a Q & A session. 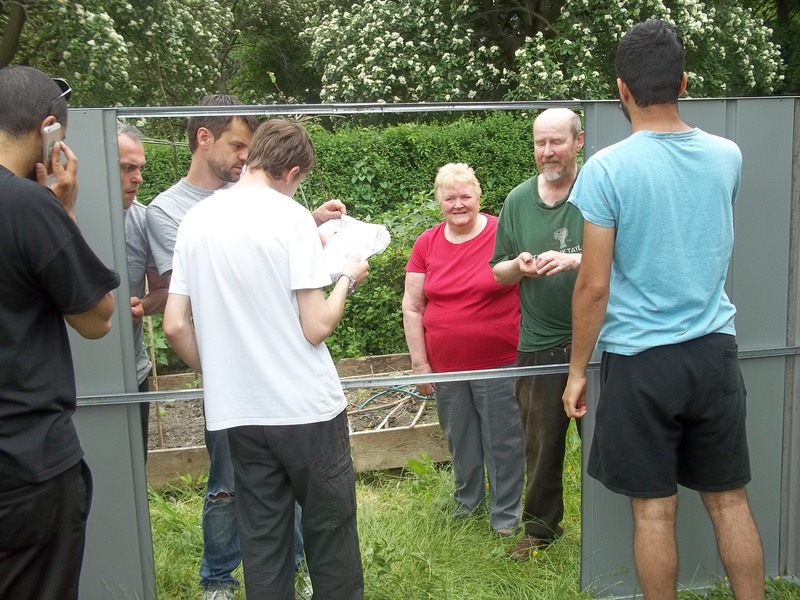 The report will prove useful for planners and commissioners in directing resources into projects that target Men in a much more informed way than previously. 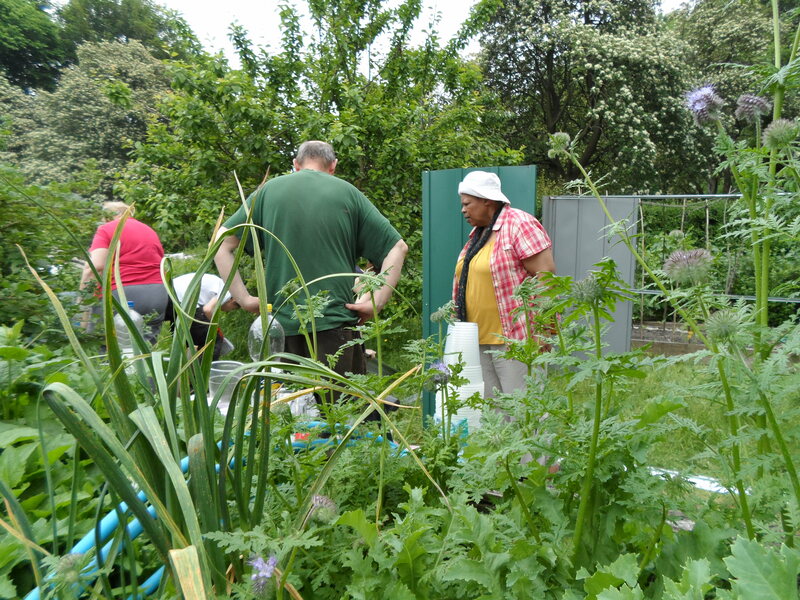 The report highlighted the big disparities in Men’s Health between more affluent and poorer communities within Leeds. 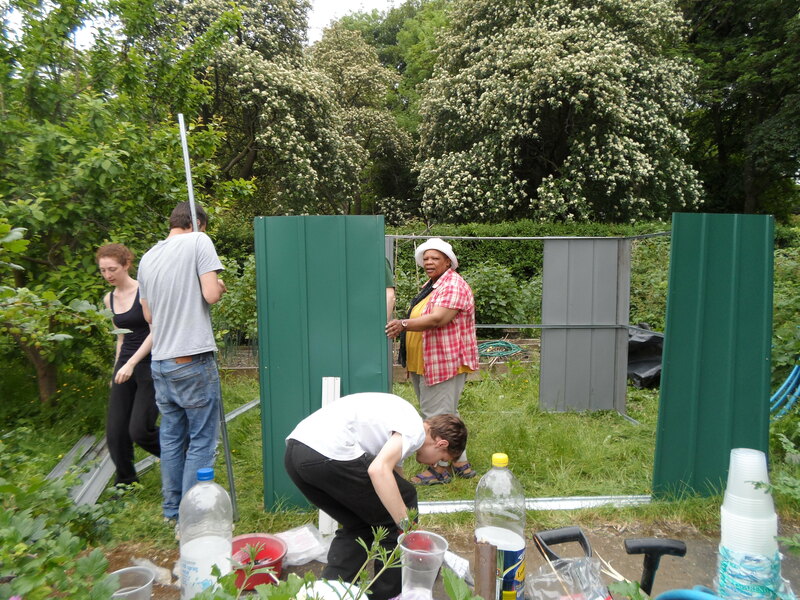 Students from Leeds Beckett University kindly helped to erect a shed on the Caring Together allotment on Wednesday as part of volunteers week. 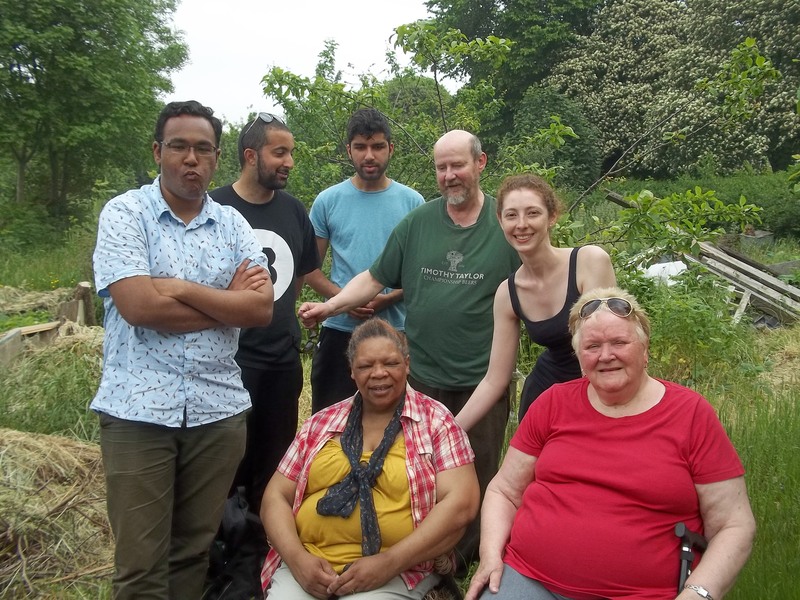 The allotment, in Hyde Park, has been run by a group of Caring Together members for the past number of years and has raised beds for ease of access. 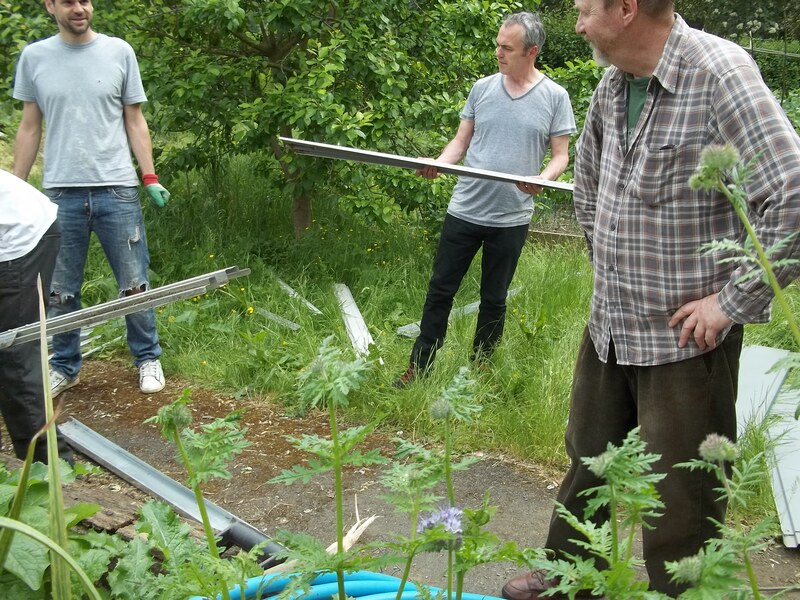 Many thanks to the students for all of their hard work and also for providing food and refreshments on the day. 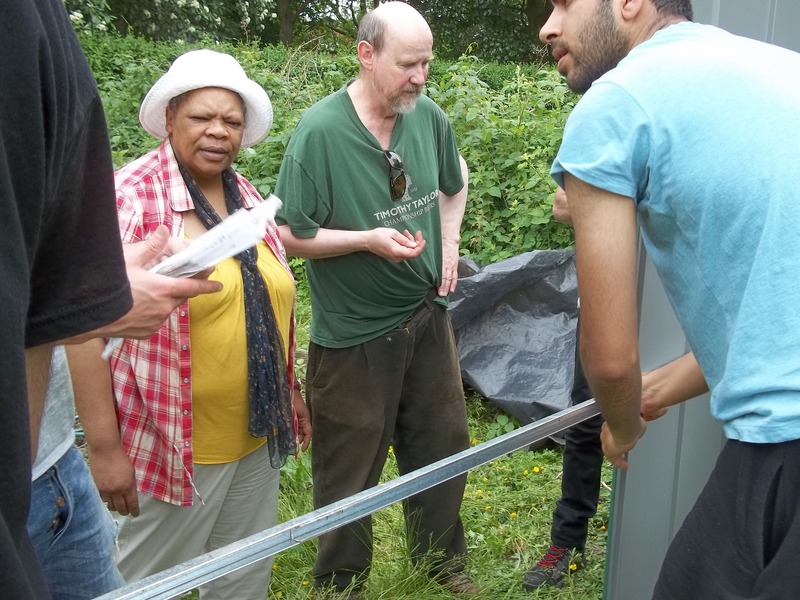 Also a big thanks to our own Lisa Hutton for coordinating this with Sheraz Hussain , the Community Engagement Coordinator at Leeds University. 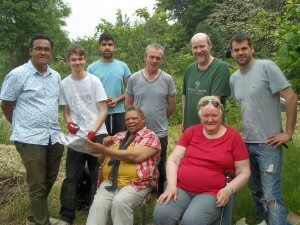 It was Sheraz’s last day in his role last Friday so best wishes to him for the future from all at Caring Together.